Since I’m running the Boston Marathon in 2014 to raise money for Newton Community Farm, my neighborhood farm-to-table resource, I’m looking for ways to carbo-load with locally-grown produce. Early March is the nadir of the New England growing season, as stockpiles from the fall harvest dwindle, and spring has not yet sent forth shoots of asparagus and herbs. That leaves just a few options: cold storage apples, potatoes, squash, and root vegetables. 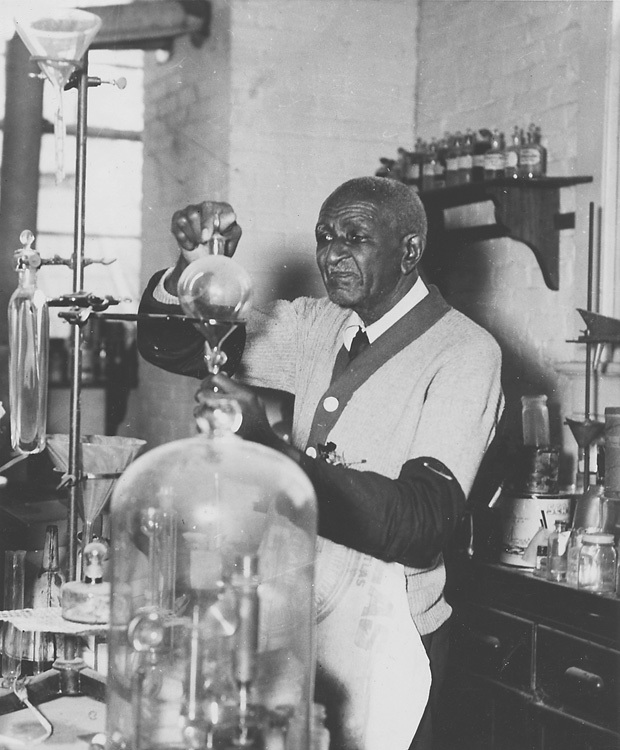 Botanist Dr. George Washington Carver in his lab. From this all-too short list, I picked sweet potatoes because they provide complex carbs as well as a mega-dose of Vitamin A (quadruple the recommended daily value), Vitamin C and potassium. For recipe inspiration, I turned to the work of Dr. George Washington Carver (1864-1943), an African-American botanist at Tuskegee Institute in Alabama who researched new ways to use crops including peanuts and sweet potatoes. The Tuskegee web site lists about 40 sweet potato products that Dr. Carver developed, including after dinner mints and mock coconut. 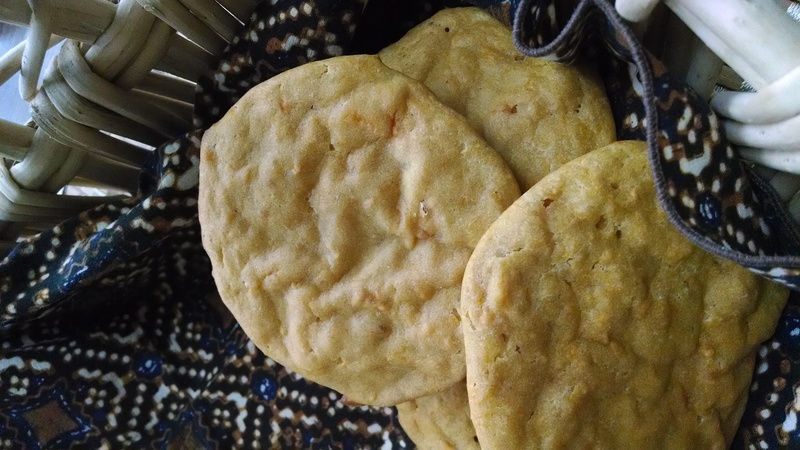 Dr. Carver’s sweet potato biscuit recipe comes from “How the Farmer Can Save His Sweet Potatoes and Ways of Preparing Them for the Table,” Bulletin No. 38 of his 1922 Experiment Station. The text is half the original quantity, with my clarifications in parentheses. The batter proved quite thin, so next time, I’d use less milk. Also, I expected a more assertive sweet potato flavor, but maybe that didn’t matter to a man who also used sweet potatoes in dyes and hog feed. In any case, the biscuits helped fuel me for an 18-mile run, so I guess they served their purpose. Mix all dry ingredients (flour, baking powder, salt and sugar). (In a separate bowl), stir into the milk the beaten egg, potatoes, and butter. (Add the flour mixture to the milk mixture). If too soft, add more flour (I needed about 1/2 cup), sufficient to make a soft dough. Roll out lightly, cut with a biscuit cutter, and bake at 350 degrees for about 15 minutes. Note: I baked the sweet potato instead of boiling it. Wash the potato, leaving the skin on, and split it in half lengthwise. Place it cut side down on a baking sheet lined with aluminum foil. Bake at 400 degrees until the potato is soft, about 1/2 hour. When cool enough to handle, squeeze the flesh from the skin and mash it. Discard the skin and proceed with the recipe. This entry was posted in Food, History and tagged biscuits, Boston Marathon, George Washington Carver, Newton Community Farm, sweet potatoes, Tuskegee. Bookmark the permalink.